Support the Cal-Diego Paralyzed Veterans and have fun doing it! Don’t miss out on our special 10th anniversary registration price of $10. All registrations postmarked by September 1 are only $10. After September 1, on-site prices will apply, so take advantage of our discounted price before it’s gone. October 12-13 is the date, so make sure to put it on your calendar. 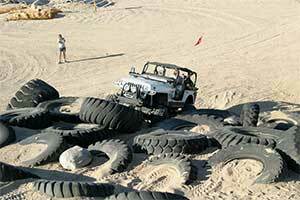 This event is open to all 4X4’s, motorcycles, ATV’s and Side-by-Sides. Like last year, we will have the event at the Truckhaven 4X4 Training Facility in the Ocotillo Wells SVRA, which provides open, dry camping. The raffle is shaping up to be another great one, and we welcome any donations. Check us out on Facebook or go to check this page to register or even donate to this worthy cause. We can’t do it without you!